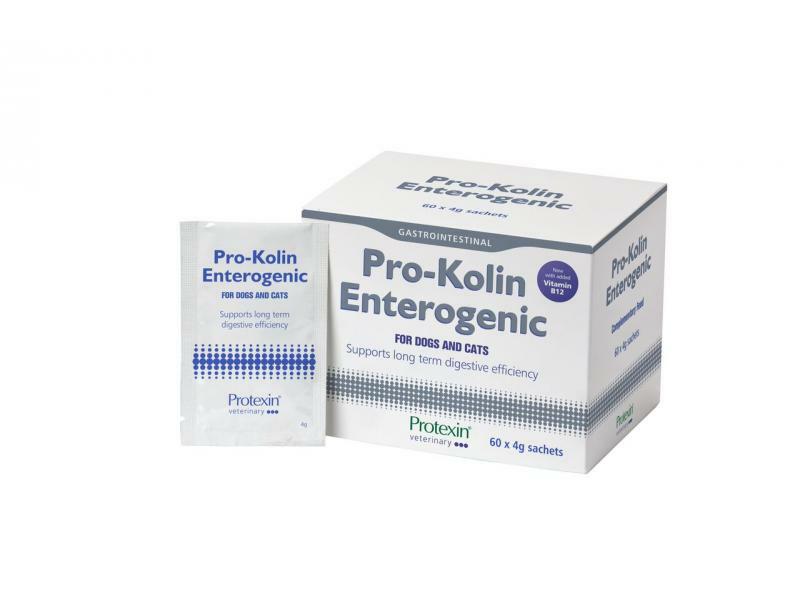 Pro-Kolin Enterogenic is designed to be used long-term to help promote gastro-intestinal management Pro-Kolin Enterogenic contains several different ingredients which work together to achieve the desired effect. These include a special type of starch which passes down into the large intestine where it is fermented by the bacteria present to produce butyrate. This is the ideal food for the cells lining the large intestine and so promotes their health and function. There is also a mucopolysaccharide which reinforces the mucin lining the intestine, improving the important barrier function of the intestine. 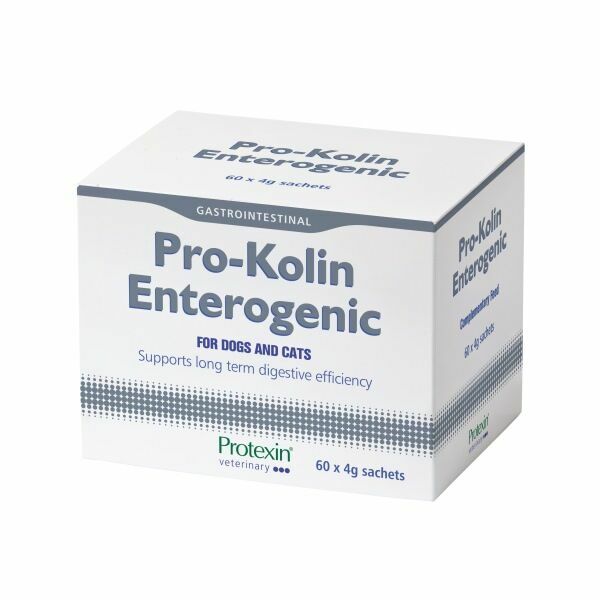 Pro-Kolin Enterogenic also contains a particular strain of the "good" bacterium Enterococcus faecium. The growth of the good bacteria is encourage preferentially by the prebiotics also included - (ructo-oligosaccharide, Gum arabic, mannan-oligosaccharide (MOS) and beta-glucans. Beef flavouring is also included to provide great palatability. Below are some recent questions we've received regarding Protexin Pro-Kolin Enterogenic, including answers from our team. I have a litter of puppies, now 11 days old, one of whom has started with diarrhoea this evening. Is this product suitable for such young pups and if so how would it be given? As a paste on the tongue? I would not suggest using this particular product on puppies which are still on an all-milk diet. A pro-biotic might be fine, but this is a pre-biotic too, meaning it contains certain types of food as well as "good" bacteria. It might well be OK to use, but I would suggest something like Protexin Pro-Soluble instead. A tiny amount mixed with water can be dropped on the tongue, or just into the mouth. This should be a very good product to give your dog and it has a good chance of being helpful. In addition you should feed your dog small, frequent meals. It is best to reduce the total amount of food going through the gut to give the digestion an easier time, but do not stop completely. Probably if you give your dog 4 meals per day, but make each one about half the amount your dog would like to eat, then the digestion will get back in control much more quickly and ultimately your dog will do better and get more benefit from its food. Your dog should finish each small meal by licking out the bowl and looking around for more. If this is not happening, you are giving too much and overloading the digestion. You should not allow it to fill itself up until the stools have been well formed for a few days. This one measure is often as useful as any other. If this and the Pro-Kolin fail to work, then you might need to look at a different food as well as go back to your vet. I would try the Pro-Kolin and reduced food first, as long as your dog is basically bight and perky. Does Pro-Kolin Enterogenic contain calories? My 9 year old tom cat has been diagnosed with colitis by my vet. She said it was likely to be stress or diet related. He is now on zylkene and Hills I/d Gastrointestinal food, which is helpful. I am also giving him Pro-Kolin enterogenic, but I have noticed that it contains starch. Ginger easily puts on weight, because he does not know when to stop eating. Do I need to feed him less, because of potential calories in the Pro-Kolin Enterogenic? The starch that is present is the Pro-Kolin Enterogenic is actually a resistant starch, this means that is doesn’t get digested in the stomach and small intestine as other starches do and instead, it reaches the colon where it is fermented by the beneficial bacteria. This fermentation of the resistant starch produces short-chain fatty acids that are used as a food source by the colonocyte cells that make up the lining on the colon. As such, it is not an energy source that is available directly to the animal as other starches would be and therefore any calories present (which are minimal) should not impact the cat’s weight. As with any cat that is prone to gaining weight, the volume of food that is fed should be adjusted to maintain an ideal bodyweight, but the addition of the Pro-Kolin Enterogenic should not adversely affect this situation. my old girl is hyperthyroid and last bloods showed early signs of kidney issues. she suffers occasionally from bouts of very loose , smelly stools, would this product be ok for me to use with out exacerbating any rumbling kidney complaints? This product should be perfectly safe to give to your pet and it might well work very well. We receive good reports about how effective it can be. I have a 2 year old Weimaraner and he has a long history of soft stools. I used to feed him Orijen but up to a point I had to change to prescription dry food for him and it lasted about 2 months. When he was on prescription food his stools returned to normal during that period. Then I gradually changed to Canagan with some Fleischeslust meat and his stools were also okay. But recently this combination seemed to be no working quite well for him his stools became soft again and its has been 2 weeks now and he is not getting any better. Which one is better for me? Yumpro BioActv or Protexin Pro-Kolin Enterogenic? Or I shall try Pro-Kolin for a few days first? There is no way of predicting with any certainty which product is most likely to be effective. However I would say that I hear so many reports about the good results achieved with Pro-Kolin Enterogenic, that personally I would certainly try that. I would also be tempted to try and find a food which worked and stick with it. Why did you changed from the prescription diet? Perhaps you could have stayed on that permanently too. Is there any difference between Pro-kolin paste and powder? 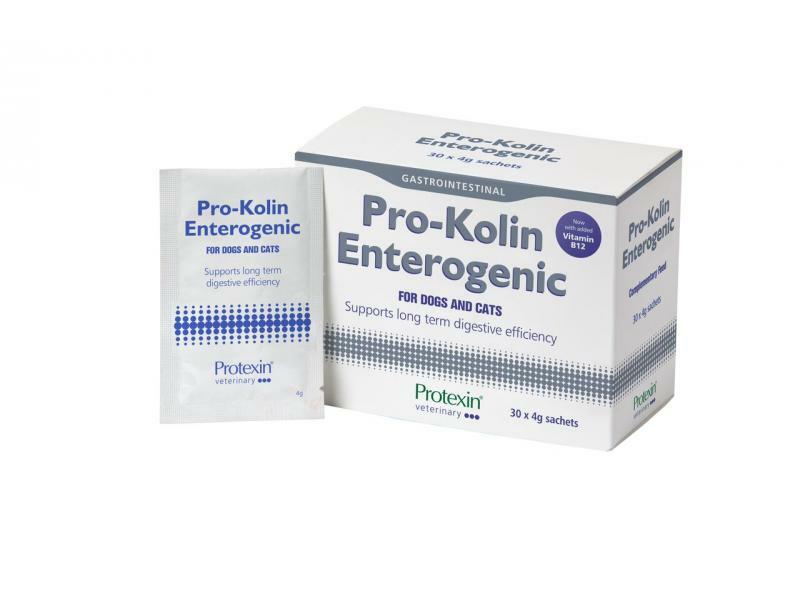 Protexin Pro-Kolin Enterogenic powder is designed for long term use of managing gastro-intestinal sensitivities and recurrent upsets, whereas Protexin Pro-Kolin+ paste should be used to settle diarrhoea quickly and safely for short periods of time (2-3 days).